Hail damage to a roof or home can cause minor or major damage. Either way it can turn into a big problem if you don’t find the right Hail damage repair contractor to help you out. The severity of damage to the roof from the hail depends on several things, including, the type of shingle, age of the roof materials, the size of the hail, and the slope of the roof just to name a few. Asphalt fiberglass shingles make for the majority of insurance claims for roof damages caused by hail. The extent and severity of hail damage to shingles are not as visible from the ground as other common roofing materials such as wood shakes or metal panels. The most popular damage to shingles from hail comes in the form of a circular pattern that shows an area of granule loss. It is much like what a golf ball does to a green from a chip shot that is about 60 yards out. This damage is usually visible immediately and it will affect the area it landed on. This kind of damage will definitely shorten the lifespan of the roof dramatically. One of the first things we do as a Roofing Contractor is to determine the amount of damage if any that was done to your roof from the hailstorm. We are able to do this by determining the size of the hail that was present at your property. This is done by looking at various soft metals on the roof and around the sides of your home. For instance, if the hail was smaller than the size of a quarter then the damage is probably very minimal. However, if the hail was the size of a tennis ball or larger than you will have significant damage to your roof and property. And of course the intensity of the wind also plays a big part in the situation as well. Because if you have big downbursts of wind from the storm this can cause even quarter sized hail to create major damage. Another major thing that happens from severe thunderstorms is that the high winds will sometimes lift or blow off shingles. This can be a problem because if it is not immediately addressed by the homeowner or a Roofing contractor the roof can start to leak and that can cause a major problem. This happens more frequently than you would think with storms. Most homeowners think if they can’t see anything that all is well. Then they notice a spot on a ceiling or wall inside the home. The good news is that Johnson Exteriors does a wonderful job of providing same day Roof Leak Repair service for anyone that calls. If you can catch that your roof has a some shingles missing right away after the storm you are usually able to solve the problem before it gets to big and you can usually avoid having to call your insurance carrier for a claim. Filing a claim under your homeowner’s insurance policy can be a very stressful situation if it is your first time. If you don’t find the right contractor that specializes in insurance claims helping you out you are in for a very stressful experience. That’s where we come into the picture. 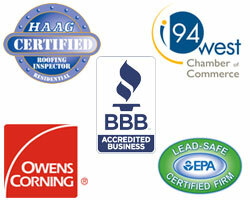 Johnson Exteriors has an excellent track record when it comes to dealing with insurance companies. We go to bat for our customers getting them the proper money for the repairs so that the only out-of-pocket expense is your policy deductible, nothing more. When we are evaluating a property for a Hail Damage Roof, the entire property has to be inspected. We look at many items such as the roof, roof vents, air conditioning units, windows, siding, and gutters just for starters. This is why it is important that you choose the right Roofing Contractor to get your repairs done. Johnson Exteriors has proven time and again to their customers and the insurance companies that they are a team of devoted professionals to take care of all your roofing repairs and insurance claim needs. Our professional expert team is here for all your storm damage needs. No job is too big and no job is too small. With Johnson Exteriors, we treat your home like it was our home. We take great pride in handling the needs of every customer we meet. Contact us today and join the abundance of clients that were happy that they did.